With the possibility of upgrading villages to cities, Travian Games has created a whole new feature for T5. This opens up new opportunities for players. They now can choose whether they wish to found a new village or upgrade an existing one to a city. In today’s blog entry, I will explain in great detail what cities are, which requirements need to be met and how players benefit from them. A city is the result of the continued development of a village. A village can be upgraded in the main building. Compared to a normal village, a city opens up a whole lot of new options for a player. The advantage here is that a city does not occupy an expansion slot. In order to upgrade the resource fields in the capital village beyond level 10, the village first needs to be upgraded to become the capital city. To upgrade a village to a city, a player has to meet a few requirements. The population of the selected village must be 600 at least. Similar to founding a new village, culture points are also required. A player is presented with the choice: found a new village or rather upgrade an existing one to become a city? The last requirement for the village that is to become a city is a crop production of at least 400 – after building upkeep has been deducted. Whether a player meets all these requirements or is still missing some can be seen in the main building at any time. This novelty comes with some advantages. For example, in a city all resource fields can be upgraded to level 12. A capital city allows for unlimited resource field upgrades of course. The population of the upgraded city will automatically increase by 400 and a player receives an additional 200 culture points a day. The maximum loyalty of a city is increased to 200%. This also seals the fate of tablets of law, which will no longer be around in T5. This will make it easier for attackers to conquer villages or cities! Finally, with the water ditch, a whole new building is introduced to the game. 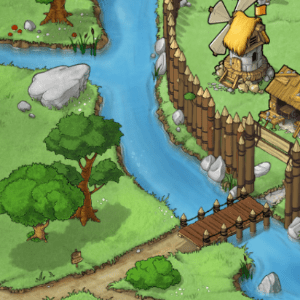 The ditch can only be constructed in cities and cannot be destroyed by rams or catapults! It therefore becomes a permanent bonus for defenders, which, at level 20, adds an additional defense bonus of 30 percent. Of course a city can also regress. If its population falls below 1,000, it will automatically be downgraded to a village. All resource fields will be downgraded to level 10 and the water ditch disappears. It’s the same for all other bonuses: the additional population, maximum loyalty or the added production of culture points. The city makes for a very useful addition to the game. This holds true especially for players stuck in war zones, but also for less active players who don’t settle or conquer that often. Particularly with the increased maximum loyalty of 200% and the new water ditch, the city offers highly effective protection. The added production of culture points and resources is considerable, although it doesn’t compare to an additional village. For a well-developed capital village, upgrading it to a city – or better capital city – is almost a must. Especially towards the endgame stage, this city upgrade will prove to be useful. I’m curious to get to know your thoughts. What do you think of this new feature? How will you use it in your strategies for a game round?